To celebrate the release of Panton’s new short film, the aptly named festive production Sleigh, which stars Matt Berry and Nigel Planer, Screenwords had the pleasure of chatting to John about the film and, amongst other things, about his relationship with writing partner and all around good guy David Quantick. First of all, for those who aren’t familiar with your work, can you explain what or who Meat Bingo is? Perhaps I should start by saying that I’m a full-time teacher, I had been teaching Film and Media Studies at A Level for a while, then it got to a stage where I just found that I was almost falling out of love with a subject that I had always loved. I then started as a little hobby making short films, and quite by chance I shot my firs film using a DSLR….and was lucky to get David Quantick to do a voice-over for it. How did your collaboration with David Quantick come about? David had turned up at the school I work at after being invited by a friend to speak to some of the students, so I was just really cheeky and said to him “look I’ve shot this little film, would you be interested in doing a voiceover for it?” and luckily he said yes. I’d written a voice-over, which was atrocious [laughs], so he thankfully re-wrote it. It was a really silly short film called Matt V Beast, which was about my friend Matt racing a greyhound. We put it out on twitter and all of sudden people started sending me their own scripts. It sort of snowballed from there, and I made films with what other people sent me and continued working with David, and now we’re seriously looking at making a feature film next year, which I would obviously have to fit into my summer holidays. 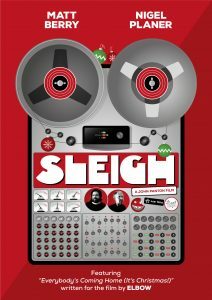 Let’s talk about your new film Sleigh and the process you as a filmmaker went through to get this made. 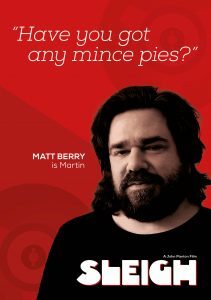 How did you get Matt Berry, who is undoubtedly one of the busiest men in the industry, on board? Scheduling was a nightmare, it was really really difficult to nail that down, but Mike [Knowles] had very generously put up, I guess what you would class as a micro-budget, which was enough to pay for the actors and so on, so we prioritised who we wanted. I went to Elbow first and said “look, I’ve got an idea and I want Matt Berry for it” and it turned out that Craig Potter and the Elbow chaps had met Matt before anyway, and I think David had had a few interactions with him too. So he got back almost immediately and said yes. I think probably the appeal of working with Elbow and David and the whole music side to it was what made it easy for him to say yes. Can you tell us a little bit about the inspiration behind Sleigh? Yes, part of the idea for Sleigh is inspired by Slade writing one of their biggest Christmas hits in the height of the summer in New York, there’s just something about that juxtaposition that makes me laugh. Trying to recreate that Christmas spirit and Christmas vibe in a situation where it’s far from being festive is just really fun to me. You also have a background in music, I believe. How did that experience help you put across the dynamic which sometimes exists between band members who basically hate each other, but still need to make a record for the money? 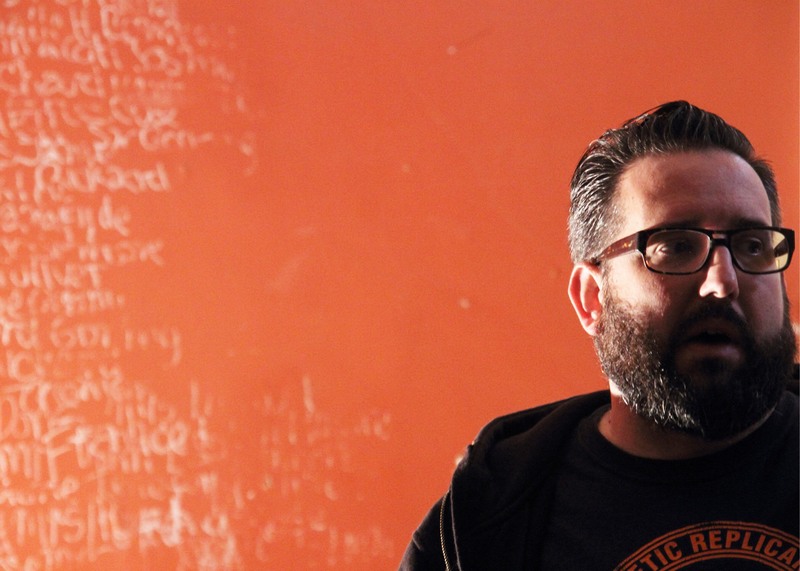 Yes, I’ve been in various bands in my misspent youth and experienced the dynamics of how bands fracture through other external influences… through either one member not being serious enough about the band or too self-absorbed. The idea was an amalgamation of various different experiences I’ve had with my own bands and other bands I’ve known and worked with. Ultimately I’ve made a really sentimental festive film which has a positive message about being nice to people. Going back to your working relationship with David Quantick. Can you talk us through the process of you having an initial idea to him writing a more polished script? The storyline is probably pretty much the same as the one I gave him, but because I have worked with him so often now, it’s quite a quick process and he can be quite blunt with me when something isn’t working…so he did a really quick turn-around on this script and then did a few more drafts and a tidied up. I’d probably gone for a drama with some comedic moments, and I think he probably tuned it into more of a comedy-drama and just made it clearer. It was nice to be able to just send it to David and say “can you sort it out please”. I suppose I know that I’m sending something that I feel isn’t complete, and I want his expertise to create a bit focus, which he did. And are you always happy with what he comes back with? 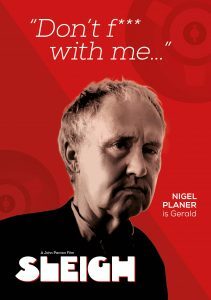 For example, I loved the story of him turning the character of Nigel Planer from a businessman into a bishop, which is such a simple, yet really effective comedic device. I think it’s important to have someone else’s perspective, because it’s something I hadn’t even considered, but in this instance I found it instantly funny, and there are some moments where I say “I’m not quite sure about that”, and we have a little email exchange about trying to sort something out. I think on the whole it’s a positive relationship, and it’s me learning as well as seeing how a professional scriptwriter works. I just gained so much from his time and positivity, and I have to be honest, there’s no way I’d be doing this now if it wasn’t for him. Finally, what’s next after this? Are you already onto your next thing? I’ve shot two already, I’ve got two shorts that I need to start editing in December. One is a spooky short called Surveyor, staring Mike Wozniak, which was shot at an incredible ruined mansion on the outskirts of Exeter called Poltimore House… it’s a spiritual sequel to a film called Line Signal which we made a while back. And then I’ve go a sci-fi film called Triangulations, which stars comedian Simon Evans. Sleigh will be released on the Dead Parrot Youtube channel at 5PM on Friday 1st of December.